What are you guys using for U-bolts? My current U-joint dimensions are 2 7/8" ID and 6" long. My engine's output is close to 500hp. I am upgrading the differential to True Track, 3.5:1, and Strange 31 splines shaft w/sealed bearings. I had already upgraded the driveshaft and to 1350 u-joints. I think most u-bolts are Grade 5. I found a set of Grade 8 from Dayton, p/n 361-400. These have a 5/8 bolt diameter and the OEM ones are 7/16" (edited). I wouldn't expect to much of an issue to enlarge the holes to 5/8". Are there other Grade 8 alternatives? Is Grade 8 really needed? Thoughts? Not 100% sure but the grade 5 maybe in there for a reason. I know grade 8 are much harder and stronger in some applications, but that hardness also makes them more brittle. grade 5 are designed to stretch since they are softer. I know when we build steel structures and cranes, we use grade 5 or A325 structural hardware because they are designed to stretch. We do not use grade 8 because they are too hard and brittle. Not sure if the same applies for u bolts and this application. My thoughts exactly Kevin. You just beat me too it. I think the 7/16" ones get torqued to 45 foot pounds, the 1/2" ones get torqued to 65 foot pounds. If you start going with giant high grade u-bolts and actually torque them to what the specification is for the size / grade / thread you are going to get clamping forces so high that there will be collateral damage. Spring plates will get bent in horseshoes, you might actually make your axle tube an oval. I'd stay with regular old u-bolts. If you find a local truck / trailer supply place with a u-bolt machine you can get decent ones bent to your specification. A buddy of mine has a u-bolt machine and I have all mine made out of blanks, the hardware that is supplied is normally very thick hard washers and the nuts are almost as long as coupler nuts. I've got 7/16" ones on my drivers side, and 1/2" ones on my passenger side. The only reason I went with larger u-bolts on one side was because the spring plate is the mount for the panhard setup I have and I wanted a little more beef. What do you mean with "boxing in" the perches? I think I get what you mean. So basically to box it in I will need to weld a piece through the width at the end of the perch. 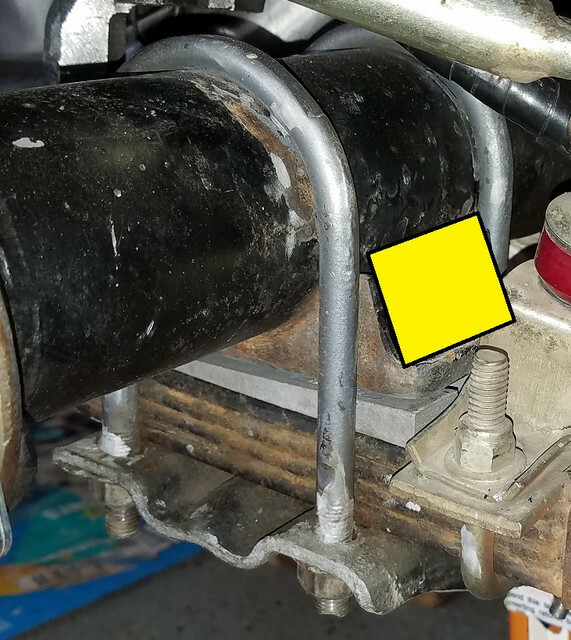 Will something welded like shown in this picture in yellow work? Edit: the "yellow" will probably need to be wide enough to be welded to the forward edge of the perch. Yes, that is the way to box the perches. I would fill the entire area in, though. You can also box the spring plates, just use large enough holes in the box plate to get the nuts on with a socket. The nuts still tighten against the original plate. I agree with the others, about Grade 8 versus Grade 5 u-bolts. Interestingly enough, Currie sells only Grade 8 u-bolts. If I did use Grade 8 u-bolts I would torque them only to the Ford torque spec of 30-50 LB-FT.
ok. So here is a modified sketch . Basically cut and weld a square piece that fits that space. Should the top of the piece be welded to the differential housing? Tony, I researched this ad nauseam back when I rebuilt my car in 2015. These were the u-bolts I ended up with. This supplier knows their sh*t when it comes to axles and hardware.